Homemade pie crust (pâte brisée) is a barely sweetened dough that is light, flaky, and buttery when baked. This in-depth tutorial teaches you the basics for how to make pie crust by hand or with a food processor. Note: This post was updated on August 2, 2018 with new content and photographs for your enjoyment. Do you love to make apple pies for Thanksgiving? Pumpkin pies for Christmas? What about a beautiful berry or cherry pie in the summer? 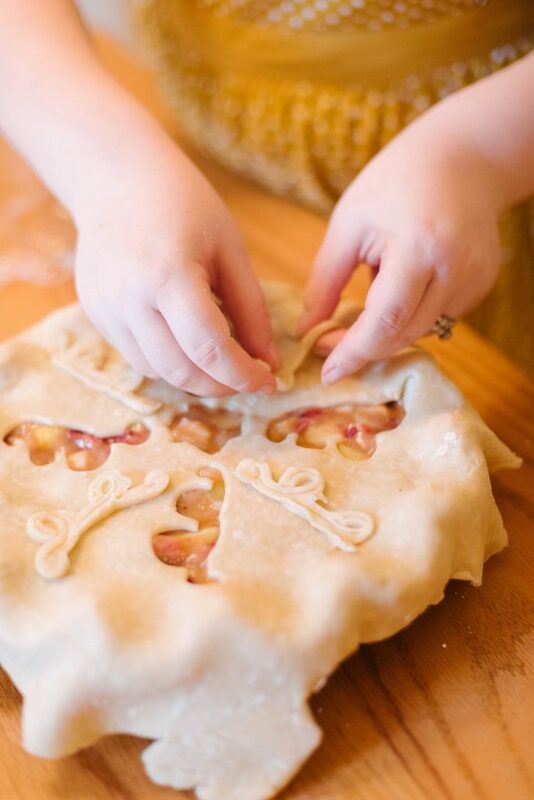 Regardless of the occasion, the pie crust can give away whether you purchased your pie or made it from scratch. Pâte brisée is the most traditional and the best pie crust recipe there is. It is a barely sweetened all-butter pie dough that can be used for many types of pie recipes. Everything from heavenly pumpkin pie, to cravable quiche, to a delectable chicken pot pie. Make sure your pie making skills are up to snuff for the flakiest and most buttery crust imaginable. 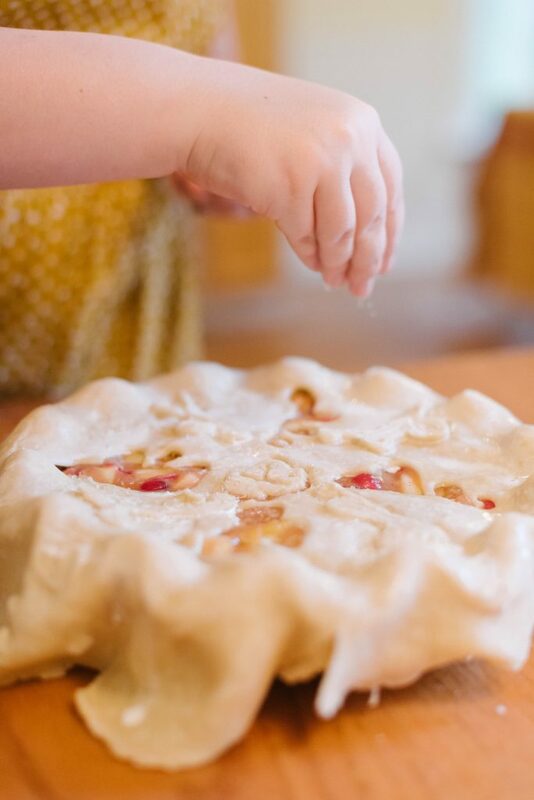 What Are The Best Ingredients For Homemade Pie Crust? Figuring out how to make pie crust at home starts with the foundations: the ingredients. The argument between butter or margarine, and vegetable shortening (Crisco) or lard, is never ending. No matter which fat you choose, you will have a fantastic pie crust as long as the method is correctly done. The major differences between these fats are in the amount of water in them. When your pie dough is baked, it releases steam from the fat which causes the flaky, light layers to form. The higher the amount of water in the fat, the more steam will be made. Butter and lard provide the highest ratio of water, so an all-butter pie crust will give you the best result. looking for both flaky and flavorful, an all butter pie crust is best. If you’re wondering about flour, ideally, pastry flour provides a softer and more delicate homemade pie crust. However, most people don’t keep any in their pantry. For the average home baker, all-purpose flour will do the job admirably. Is It Better To Make Pie Crust By Hand or With A Food Processor? Choosing the method for how to make pie crust mostly has to do with your needs. Each method has its own benefit, due primarily to the way the butter is treated, so choose according to your priorities. When making the dough by hand, the flour and butter mixture should look loose and crumbly. This texture will yield a lighter and airier crust that is more flaky. In a food processor, the mixture should be mealy. This will make a firmer and sturdier crust that can hold up to the weight of the filling. The process of “cutting” the butter into the flour by hand is called the biscuit method. Very cold ingredients and quick, tidy work are the keys to success. The warmer the butter gets as you make your dough, the less it will make your pie crust rise. Dry ingredients. In a bowl, combine all of your dry ingredients. Flour, salt, etc..
Crumb (Cut in) the butter. Use your hands or a pastry blender to smash the very cold butter into pieces no larger than a pea. Your mixture should be loose and crumbly. Add liquid. Knead the ice water into the dough until it has come together in a ball. It doesn’t need to be perfectly smooth. The more you work the dough, the tougher it gets. The tougher it gets the longer you have to let it rest. Just knead until well combined. Rest. This is the key to a good pie crust. It needs three individual rest times. Before you add filling or blind-bake, cover your dough with plastic wrap and refrigerate it for at least one hour. Use a rolling pin to roll the dough to ⅛” thickness. Wrap and refrigerate the dough to rest for at least another 30 minutes. Finally, once you fill it your crust, let it rest for another 30 minutes in the refrigerator before baking. This is important for the texture as well as preventing shrinkage while baking. Allowing the blade to do the work for you gives you more time and cleaner hands. The pattern of incorporating ingredients is the same as by hand, but the texture varies. Dry Ingredients. With the bowl and blade in place, add all of your dry ingredients into the bowl. Put on the lid and pulse a few times until completely incorporated. Pulse the butter. Pulse very cold butter a tablespoon at a time through the lid until the mixture resembles a coarse meal. Add liquid. Continuing to pulse the food processor, drizzle ice cold water into the mixture until a ball is formed. Be careful not to over process it. Just like when making the dough by hand, the more you work it, the tougher it gets. The tougher it gets, the more it needs to rest. Rest. Again, this is the key to a good pie crust. Rest your dough the same way as by hand. Now that you know how to make pie crust like a pro, you’ll want to make it all the time. 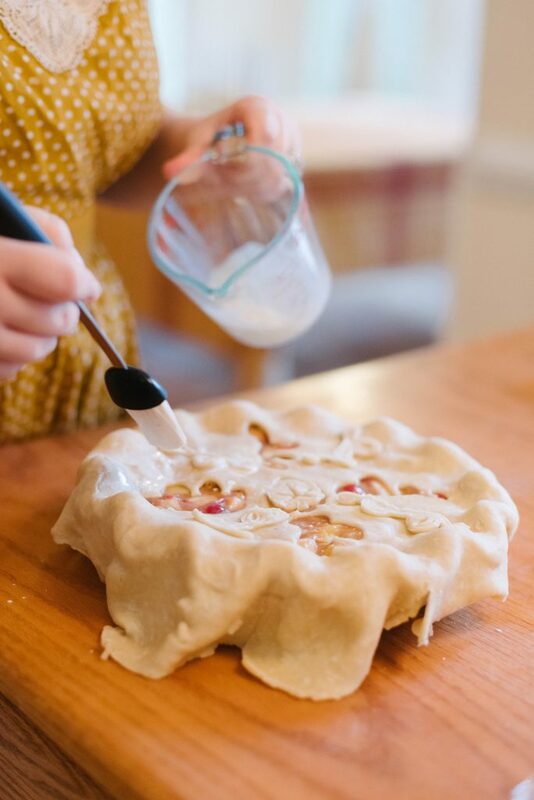 Especially since pie dough can be stored in the refrigerator for 2-3 days, or frozen for up to three months. Not sure how to freeze pie dough? Roll out the discs onto parchment paper then carefully roll the pie dough up like a sleeping bag. Wrap the rolled dough in plastic wrap then place in a ziploc bag or airtight container. (Don’t forget to label your dough with the date. Remember: frozen pie dough is only good for three months!) If you want to take it a step further, place your plastic bag of pie dough into a hard sided container. This container will protect the dough from cracking or breaking if other heavy things in the freezer run into it. Spiced Blueberry Piewith Cardamom Crust. This recipe is full of strong spices that waft of autumn and winter. It’s a great alternative to the standard pumpkin or apple pies for Thanksgiving or Christmas. Mini Chicken Bacon Spinach Artichoke Hand Pies. These hand pies make for a fantastic appetizer or dinner with a flavor combo everyone loves! Pâte brisée pie dough is the traditional French way of making pie. This recipe yields enough for a double crust (a top and a bottom crust) up to an 11 inch pie pan. It will also have enough extra dough to do a lattice top or some extra decoration. Want a free printable grocery list for this homemade pie crust recipe? Get it HERE. This traditional homemade pie crust recipe is made with only butter for a flaky, light, and flavorful crust. It’s perfect for everything from pumpkin and apple pies, to quiche, to chicken pot pie. Sift together flour, salt, and sugar into a large bowl. Use your hands or a pastry blender to smash the cold butter. Each piece should be roughly the size of a pea. Split the dough in half, wrap lightly in plastic wrap and refrigerate for 30 Minutes. Remove from refrigerator and roll each ball of dough into a 13" (or larger) flat disc that is 1/4" thick. Use flour as necessary to keep dough from sticking to the counter or rolling pin. Wrap each disc in plastic wrap and return them to the refrigerator to chill for 1 Hour. Follow pie recipes according to instructions. For any additional flavorings, like like herbs, spices, or zest, add them with the dry ingredients in step one. I love to make my own pie crusts! I use this recipe too and it is pretty much perfect! Yes!!! I love it! It’s so fantastic!